We welcome Karen Pokras Taz back to our blog today. Karen is the author of the Nate Rocks series and today we host a tour for the second book in this middle grade series, Nate Rocks the Boat. The author has a guest post, shares an excerpt, and is also holding a giveaway. Summary: With fourth grade finally winding down, 10-year-old Nathan Rockledge is looking forward to a fun and relaxing summer at home with his friends. That is, until his mom decides he has to go to overnight camp with his annoying older sister. When his best friend Tommy decides to tag along, Nathan thinks maybe his summer won’t actually be so bad. After all, he does get to be away from his mom's awful cooking for an entire six weeks. 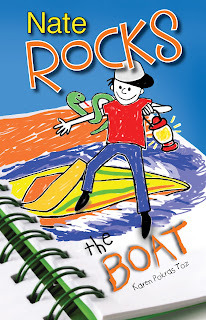 Join Nathan, Tommy, Abby, and a whole new cast of characters as Nate Rocks once again proves nothing can hold him back in this second book of the Nate Rocks series. The truth is, I never set out to write a middle grade novel. In fact, I never really set out to be a writer at all (but that’s a whole different post for another time). I started writing only just a few years ago. Writing had never been my strong suit, but I had an idea for a story, that I really wanted to get on paper. After writing the first few chapters (not Nate Rocks,) I proudly presented my masterpiece to a writing coach only to find out that it was really quite awful. Among other critiques, she told me I had a very young voice and asked if I had ever considered writing for a middle grade audience. I took her advice to heart, and began creating Nate Rocks. I knew immediately I wanted to write a boy character. Finding books for my oldest son to read was always such a chore. I wanted to write something that boys would find fun – something they could relate to and laugh out loud with while reading. At the time, my oldest was into drawing, and I came up with the idea of a boy who draws cartoons that come to life. The nicest surprise about the Nate Rocks stories is that girls and adults are loving Nate as well. Maybe it is because I have three children, but writing middle grade fiction is truly the perfect fit for me. I guess you could say my mind thinks like a ten-year-old. The best part about writing for a middle grade audience is that I get to relive my own childhood. Writing about and for children really does help keep me young at heart. Thanks so much for inviting me into your blog today. I hope you all get to experience as much enjoyment reading Nate’s adventures as I experienced writing them! I look over toward the sound of the husky voice to see a boy who looks more like he’s Abby’s age than my age. He also appears to have arms as big as my thighs and no-neck. I’ve never seen anyone without a neck before. I’m sure it’s there somewhere. It’s just that this kid’s head is enormous. I am in the right bunk aren’t I? Worse?! Tommy and I look at each other. I turn around to scan the dirt road. Dad must still be at Abby’s bunk. If I left right now and ran, I could probably get there before he and Mom leave. I’m sure Mom would take me with her to see Grandma once I explained about how dangerous it is here at camp. She’s always saying we don’t get to visit with Grandma enough. Or I could just stay at Tommy’s house. I’m certain Tommy would follow me if I took off running. But what if they were already gone? Then I would have to return to my bunk. I could already hear the other kids laughing at me as the camp director returned me to the Hawks. I look around the table to see everyone staring at Matt... Even No-Neck. 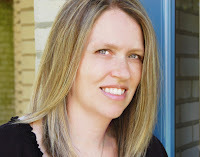 About the author: Karen Pokras Toz is a writer, wife, and mom. Karen grew up in Orange, Connecticut and currently lives outside of Philadelphia with her husband and three children. 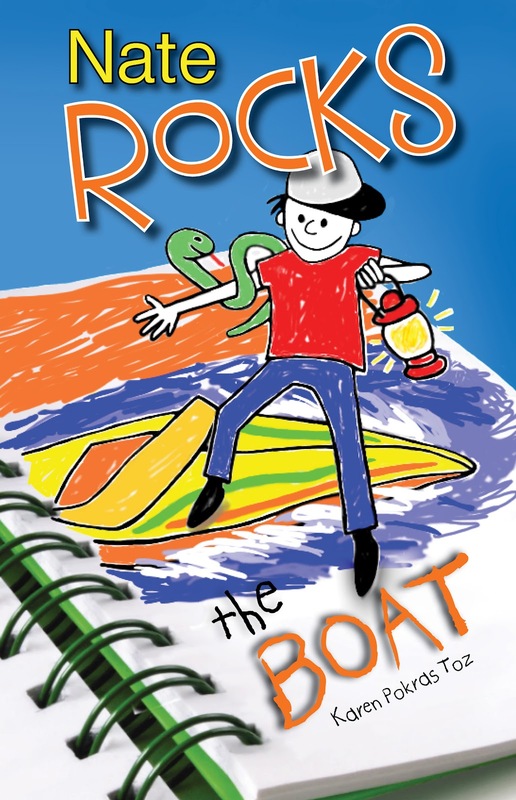 In June 2011, Karen published her first middle grade children’s novel for 7-12 year olds called Nate Rocks the World, followed in 2012 by the second book in the Nate Rocks series, Nate Rocks the Boat. Karen is a member of the Society of Children’s Book Writers & Illustrators (SCBWI). Review: Since this is a middle grade series we are leaving the reviewing to our eight year old brother, Stevie. I liked Nate Rocks the Boat. Nate is funny for a fourth grader. I'm a third grader now and my favorite book series has been Diary of a Wimpy Kid because Greg is funny in those books and there are lots of pictures. My mom signed up for a book tour then gave me some books by a nice lady named Karen Pokras Taz. She's nice cause she writes stories about boys and for a girl I think she's a really good writer. The pictures in the Nate Rocks series are colorful and cool. Nate is like some of the boys in my classes. He goes to camp and does some silly things. There are some scary things like snakes too. I'm glad I read the Nate books at bedtime and mom and me read them out loud. We laughed a lot. Greg from the Wimpy Kid books is cool and now, so is Nate. I think boys in elementary school will like Nate--he's funny and sounds real. Nate could be my next door neighbor (but he's not, there's a girl living over there but I'd rather have Nate). 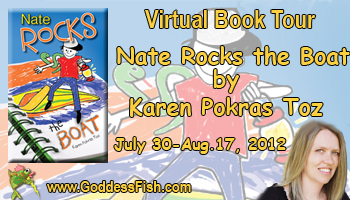 Karen will be awarding a $25 Amazon GC to one randomly drawn commenter during the tour and an autographed set of books (Nate Rocks the World & Nate Rocks the Boat) to one randomly drawn host from the tour. Follow the tour and comment. Thank you so much! I have a very talented artist named Deana Riddle who does my covers. She is amazing! My granddaughter would love to read these books. I'll be putting them on my "to buy list'. I've enjoyed reading your post. Thanks for the opportunity. Thank you Carol! You'll have to let me know what your granddaughter thinks. A great review thank you Stevie. I know my daughter will love Nate Rocks. Thanks for your comment marybelle. Yes - girls are loving Nate also! Staying young at heart is one of the most important things ever! It must be such fun to wriite about Nate-- I know I'm having fun learning about him! Thank you for sharing! Great review. Great book for kids and for adults. An accidental writer. Pretty good for an accident! This looks cute and I bet the story is more wonderful than it seems! Thanks so much for all your nice comments! Thanks everyone! Stevie added that girls would like Nate too but his comment didn't post yesterday.